EverSmile White Foam - Pearl Dental Clinic, Kingston, London. Select Can I get Invisalign? EverSmile White Foam How does Invisalign work? Invisalign at Pearl Dental Clinic Invisalign Frequently Asked Questions Invisalign Use and Care Guide The Advantages of Invisalign? What Is Invisalign? EverSmile White Foam is used with clear aligners to whiten the teeth while wearing your appliance. The method is simple, safe, and also provides many other benefits. The product contains safe levels of hydrogen peroxide to ensure a beautifully white smile without damage to the teeth or gums. 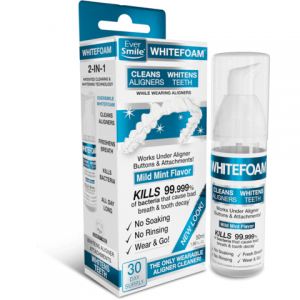 How does EverSmile White Foam work? Using the Eversmile White Foam bottle, administer just one pump of the nozzle into one half of the aligner. Once applied, spread the foam evenly throughout the aligner. Then apply the aligner to your teeth as you usually would. Excess foam may seep from the aligners into the mouth. If this happens, spit out the excess. Ensure you wear the aligners and whitening foam as directed by your dentist. What are the product’s benefits? EverSmile White Foam whitens the teeth while you wear your aligner. Therefore, this product is a great accompaniment to Invisalign or Simpli5 treatment, as well as Essix or Vivera Retainers. Not only does the product whiten your smile but it also efficiently cleans aligners to a sparkling finish. It also helps to freshen the breath. Minimal effort is needed as you would be wearing your aligners anyway. The product does not cause aligners to become mishappen like bleach. The product even penetrates below aligner attachments for even whitening. There are no reported issues of tooth sensitivity after using the product correctly, and it can be used over many months. EverSmile White Foam can be used to soak aligners (for cleaning purposes). However, this is not usually necessary if you are using the whitening foam daily. The product will start to work from the first application. However, it usually takes around three to four weeks to see noticeable results. Furthermore, the product can be applied to the aligners up to four times a day, if your dentist advises this. This may yield faster results. You can purchase EverSmile White Foam from Pearl Dental Clinic on the recommendation of one of our dentists or orthodontists. If you are not currently a patient with us then you can book in for a consultation to discuss your suitability. We can also provide an array of other professional whitening treatments at the clinic. Book in for a FREE cosmetic consultation to find out more. Pearl Dental Clinic is open 7 days a week from 9am to 10pm. You can book a FREE EverSmile White Foam consultation by calling us on 020 3613 3185 or emailing us or book an appointment online.